I did my 5th consecutive day on the bike today, and for the second day running I did the CTS climbing DVD. That brings the total to 5:10 of cycling since Monday. The perceived intensity today was the highest I’ve felt this week – the absolute intensity was the lowest of the week – time for a break! Hopped on the bike after work and did the CTS Climbing DVD. 55 minutes of climbing simulation. It’s pretty good but Charmichael’s jokes leave little to be desired – he should stick to the training advise! I’m aiming to be hitting my 30k run 70 days out – that leaves 47 days (or a little under 7 weeks) to build up to it. If I manage a 18k run on Friday and add 2k/week from there then I’ll just make it. 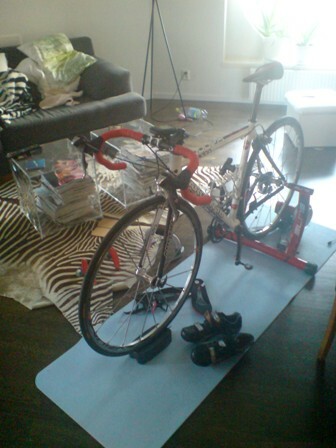 I did some cycling in the evening: 80 minutes on the trainer. Intensity was pretty easy but all in all it was pretty difficult. Second consecutive day in a row on the indoor bike. Just an hour tonight – at a steadier effort than last night. I kept the intensity pretty much the same for the hour and varied cadence between 75 and 95 every few minutes. I moved the cleat in my left shoe today (after the cycle). I moved my foot position back and in, in an effort to take some of the strain off my arch – which is begining to feel odd. I may have to put arch supports in the shoes if this does not feel better. I’m having trouble getting into the training this year: I had three days off after my return to training – a return was way too hard in intensity. Last night I set up the bike in the living room, put on the Giro d’Italia DVD and cycled. I planned to just take it easy for one hour but got bored and then started to do hard efforts during the lead outs for the sprints… These varied from 3-5 minutes a piece and by the time I was 40 minutes into the session I was pretty much fried. From there I just held a steady effort and cadence for the remaining 20 minutes and called it a day. I’ll try to focus on the bike this week and see what sort of form I can get from it. If I do and hour a day Monday->Thursday and then the 3 hours spinning on Saturday that would be my longest cycling week in two years… lets see what happens.